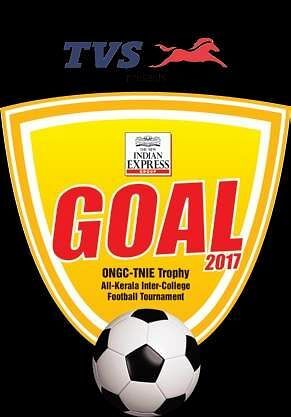 MALAPPURAM: Defending champions NSS College, Manjeri crashed out of TNIE GOAL 2017 as MD College, Pazhanji, recorded a single goal victory against them in the pre-quarterfinal held at Malappuram District Sports Council Stadium on Sunday. 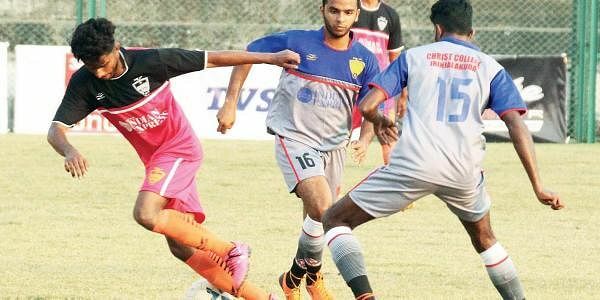 Having proved themselves by drubbing Dhanuvachapuram VTM NSS College 5-0 in the pre-quarterfinals on Wednesday, MD College were at it again, as substitute forward Shakir scored the clincher in the 72nd minute. NSS fielded an impressive midfield featuring Kerala state team starlet Jishnu Balakrishnan in the centre and state camper Mohammed Jasim playing through left. Their line-up also boasted of Mahin P Hussain, who took MSP HSS, Malappuram, to an impressive second in the 2014 Subroto Cup. But for all the midfield riches, the game had to wait until the 34th minute to see its first clear goalscoring opportunity. Rafeeq failed to find the target after Mahin created the chance dribbling and crossing from the left. A minute later, Rafeeq turned provider and it was Shafeeq M who fired the shot over the goal this time. No more chances were forthcoming in the half as the local side went back to their dressing room as the more disappointed of the two teams. Post halftime, Jishnu went close and opened the scoring for NSS in the 69th minute, by running past MD College defence. His shot, however, whizzed past the post. Just two minutes later, Rafeeq’s bicycle kick hit straight at the hands of MD custodian Shahanas C V. However, the fatal blow landed soon when substitute forward Shakir kept his cool and rolled the ball past an advancing NSS goalkeeper to score the winner. While NSS College tried to search for an equaliser in the remaining time and additional minutes, with Mahin firing over after Jishnu squared the ball to him neatly inside the area in the 86th minute, they went down, and finally, out. In the earlier game of the day, Antony Paulose scored a hat-trick to help Christ College, Irinjalakuda overcome Payyanur College 3-1 and book their spot in the quarterfinals. The match witnessed another Santosh Trophy star in action in the form of Muhammed Parakkotil who orchestrated the game from Irinjalakuda college’s midfield. Christ, the better team in the first 45 minutes, took the lead when Antony scored, but Payyanur equalised through Mridhul M N’s goal in the 70th minute after a pinball inside the penalty box. The deadlock didn’t last long as Antony hit back three minutes later. It was game, set, and match in the 82nd minute when Antony completed his hat-trick to book a quarterfinal berth for Christ College.